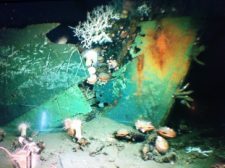 The National Oceanographic Partnership Program (NOPP) is pleased to announce that the Gulf of Mexico Shipwreck Corrosion, Hydrocarbon Exposure, Microbiology, and Archaeology Project (GOM-SCHEMA) is the 2017 recipient of the NOPP Excellence in Partnering Award. The Excellence in Partnering Award is given annually to a NOPP project that best exemplifies the NOPP’s objective of developing a successful network of partnerships to advance the ocean sciences. Hull of the 19th century wooden-hulled Ewing ship wreck. 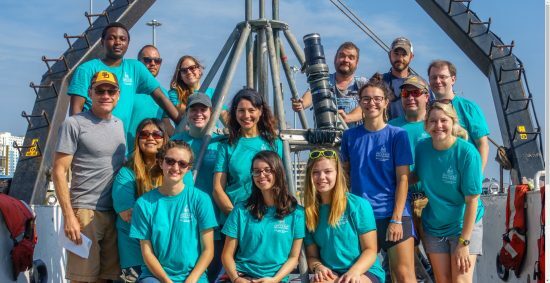 The GOM-SCHEMA team, led by Dr. Leila J. Hamdan of the University of Southern Mississippi and Melanie Damour of the Bureau of Ocean Energy Management, investigated the impact of oil exposure on historic shipwrecks from the microscopic to the macro scale during a four-year period and the subsequent recovery of these sensitive deepwater habitats in the Gulf of Mexico. During this project, the team discovered that a sunken WWII German U-boat and a 19th century wooden-hulled sailing vessel located within 10 miles of the spill’s origin had been exposed to the fallout plume of the 2010 Deepwater Horizon oil spill, and that such exposure could have negative impacts on the long-term preservation of these non-renewable, historically significant cultural resources and their resident biological communities. 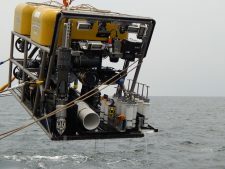 The Global Explorer ROV was used to collect video and sonar data, deploy biofilm monitoring platforms and recover sediment, coral and debris samples. The GOM-SCHEMA project involved scientists from disparate disciplines that rarely interact, such as marine archaeology and microbial ecology, and it exemplified the effective use of public-private partnerships in understanding the role of historic shipwrecks as deepwater ecosystems. The project also actively involved K–12 classrooms in its research expeditions through real-time interactions and an ROV design and testing competition. Sediment, water, coral, wood, and metal samples were taken for a microbiological and molecular ecological study of shipwreck communities. GOM-SCHEMA’s partners include the Bureau of Ocean Energy Management, Naval Research Laboratory, Office of Naval Research, Bureau of Safety and Environmental Enforcement, George Mason University, University of Southern Mississippi, Oceaneering Inc., Droycon Bioconcepts Inc., the PAST Foundation, Montana State University, and Louisiana Universities Marine Consortium. The GoM-SCHEMA research team after a 2017 cruise. Additional collaborators after the project’s onset included the American University, Deep Sea Systems International, University of Georgia, University of Texas at Austin, and Woods Hole Oceanographic Institution. As the winner of the 2017 Excellence in Partnering Award, the GOM-SCHEMA project will be honored during the closing plenary of the 2018 Gulf of Mexico Oil Spill and Ecosystem Science Conference, taking place from February 5 to 8 in New Orleans, Louisiana. For more information on the research, please visit the BOEM website and the University of Southern Mississippi website.